My mother made this salad and my family loves it. It uses everyday ingredients on hand. I cut the amounts for the dressing in half, to decrease the amount of left over dressing. 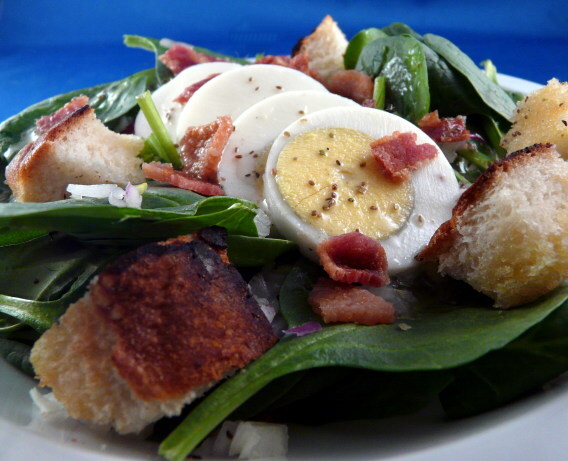 Mix spinach, eggs, bacon and croutons together. For dressing, mix onion, sugar, salt, pepper, celery seed, vinegar and oil. (I mix up the dressing and let it sit for an hour or two, in the refrigerator, to let the flavors meld before serving). Drizzle all with dressing to taste. This dressing keeps indefinitely in refrigerator.